The weather is finally cooling down so it’s the perfect time to announce our Autumn Releases for 2018, two new delicious new reds just in time for winter. Following on from a highly successful 2015 vintage, our 2016 Thirteen31 Pinot Noir is another fabulous wine. Good late winter rain gave the vines a kick start, but a warm end to summer meant that the fruit was picked relatively early on 3rd March. Our “Thirteen31” Pinot exhibits typical varietal characteristics from our south facing estate. Just a touch riper at harvest than the 2015, the nose shows rich dark cherry with elegant musk and spice overtones. The palate has full varietal fruit flavours with lovely mouth feel and soft tannins. We expect this wine to develop into a luscious, velvety Pinot Noir over the next couple of years. Certainly suitable for medium term cellaring, drink now through 2022. Another tough act to follow after the 2015 blend, but another full bodied red blend for 2016 to complement our straight varietals. 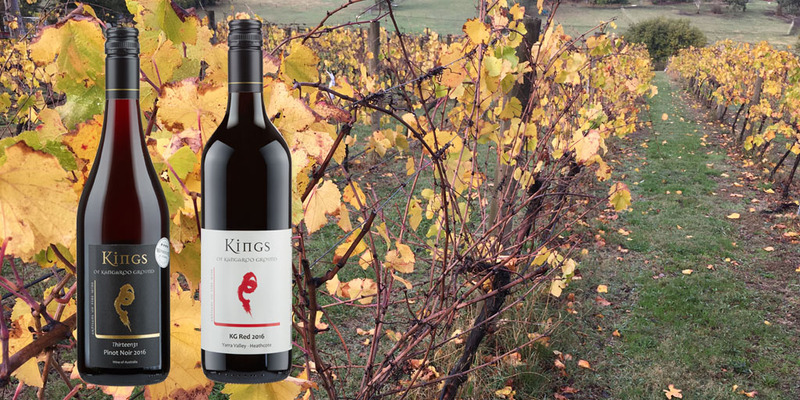 And the “KG Red” moniker makes a formal comeback, with a classic red blend of 60% Cabernet, 20% Shiraz and 20% Pinot Noir – the Cabernet is from our Di Paolo block in Kangaroo Ground, the Shiraz from the Coliban Glen vineyard in Heathcote and our estate Pinot Noir rounds out the blend. The wine presents as an easy drinking full bodied red with dark berries on the nose and a hint of mocha. The palate is vibrant and full of fruit with good balance and soft tannins. This wine certainly has the structure to improve with medium term cellaring, drink now through 2024. Both these new releases are available now at Cellar Door, our online wine shop or at upcoming Farmer’s Markets. And don’t forget to check out our Winter Warmers 6 packs in our wine shop – a great way to sample a range of Kings wines in front of a cozy fire this winter.